1. How many adults have prediabetes? 2. What was the total medical cost for those with diabetes in 2012? 3. What is a normal fasting blood sugar level? Prediabetes is defined as blood sugar levels that are high but not high enough to be diagnosed as diabetes. Diabetes is a condition when your pancreas makes insulin but the cells do not respond to it. Insulin is needed for glucose (sugar) from your food to enter the cells and give you energy. Uncontrolled blood sugar can increase your risk for heart disease, stroke, kidney failure, blindness and other medical conditions. Diabetes carries high medical costs and may be associated with loss of work and wages. As of 2017, about one out of three adults has prediabetes. More men (36.6 percent) than women (29.3 percent) had it. Nine out of 10 people do not know they have prediabetes. Find your height in the box. Is your weight the same or more than listed? Add up your score. If your score is 2 to 8, your risk is low. If your score is 9 or higher, your risk is high. Be sure to get screened by a health-care provider. You can reduce your risk of developing diabetes by losing weight, eating healthfully and being more active. If you are overweight, losing just 5 to 7 percent of your weight can reduce your risk for developing Type 2 diabetes. Create a menu plan that includes a variety of colorful fresh fruits and vegetables, whole grains, lean meats, poultry and other proteins, and low-fat or fat-free dairy products. See www.choosemyplate.gov to learn more about your food choices. Limit foods high in trans fat, saturated fat and sodium. Read nutrition labels to be aware of your choices. Be mindful of your beverage choices. Drink water when you are thirsty instead of sweetened beverages. Exercise at least 30 minutes per day five days per week. Begin slowly and work your way to 30 minutes if needed. Cook pasta and frozen peas according to package directions. Drain, rinse with cold water and drain again. 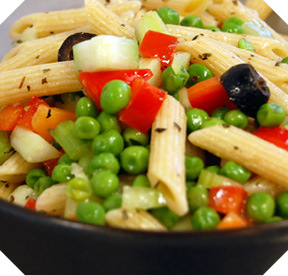 In a large bowl, combine cooked pasta, peas, red pepper, celery, cucumbers and olives. Sprinkle the basil over the top. In a separate bowl, combine the red wine vinegar, olive oil, garlic, salt and pepper; mix well. Pour the dressing over the pasta and toss gently to combine. Refrigerate until ready to serve. Makes 12 servings. Each serving has 150 calories, 3.5 g fat, 5 g protein, 25 g carbohydrate, 1 g fiber and 75 mg sodium. Preheat the oven to 350 F. Cut each pita into eight equal wedges. Pull each wedge into two pieces. Coat both sides of the pita wedges lightly with olive oil and place in a single layer on large rimmed baking sheets; sprinkle with seasoning. Bake for 15 minutes, or until golden and crisp. Allow the crisps to cool; serve immediately or store in an airtight container until ready to use. Enjoy with hummus dip. See recipes on the NDSU Extension Service website. Makes 12 servings. Each serving has 130 calories, 5 g fat, 3 g protein, 18 g carbohydrate, 0 g fiber and 170 mg sodium. Place the chicken in a slow cooker and sprinkle the garlic powder, pepper and chili powder on the chicken. Add the sliced onion and water and cover. Cook on low for six hours or until done. Drain the water from the slow cooker and shred the chicken with two forks, mix in the barbeque sauce and reheat for an additional 15 minutes. Assemble the sandwiches using extra barbeque sauce and other toppings if desired. Makes four servings. Made with chicken, each serving has 240 calories, 4.5 g fat, 21 g protein, 21 g carbohydrate, 1 g fiber and 250 mg sodium.